Move to Marketing. Campaign management tools enable PSPs to offer next-level marketing.. The proper use of data enables marketers to better target campaigns for optimal results. Taking it a step further, reporting functions allow for tracking and trigger-based marketing, providing the opportunity to improve campaigns on the fly. For print service providers (PSPs) making the move to marketing service provider (MSP), advanced campaign management tools enable better creation, management, and reporting of multi-channel marketing campaigns. Select campaign management tools allow PSPs and MSPs to enable integration and sophisticated reporting, capabilities that open the door for the PSPs to become a value-added marketing partner. “Campaign management tools can help PSPs expand their portfolio of offerings by giving their direct mail customers technology for deploying personalized, multi-channel marketing campaigns quickly, easily, and with limited extra expense,” explain Paul Fitzgerald, senior director of strategic alliance, PTI, and Annette McCrary, director of strategic marketing, Ricoh. MSPs and PSPs interested in becoming more involved in cross-media marketing have access to tools that allow them to step up to the plate and prove their worth as a marketing partner. In addition to creation, deployment, and management features, campaign tracking and reporting functions take the role a step further, offering the ability to review real-time reporting, respond by adjusting messaging on the fly, and close campaigns with quantifiable results. While it does require an investment in time and resources, the benefits of measuring and acting on results is one MSPs and PSPs should consider. PSPs benefit from taking the reins on customers’ marketing campaigns. This includes creating, deploying, managing, and tracking cross-media services. 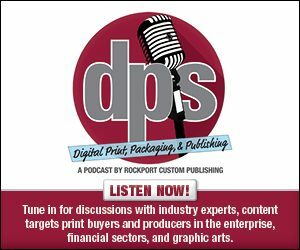 “For starters, it means the printing company moves upstream in the decision process with their customers,” suggests Charlotte Tueckmantel, GM, Web to print and value-added products, EFI. This translates to the transition from a supplier that only deals with a procurement or supply chain management looking for ink on paper at the lowest price, to an MSP that is integral to launching and managing successful campaigns. “This builds loyalty in a way that cannot come about in a procurement environment driven by lowest-cost-wins requests for proposals,” she adds. “The advantages of leveraging your PSP and MSP partners include no longer having to rely solely on internal marketing organizations to do everything from creation to tracking to reassessing,” say Fitzgerald and McCrary. They now have a partner to provide the content for print, digital, or both for campaigns with the ability to create, track, and fine tune as results are seen. Tueckmantel points to research from advertising agency BBDO, which indicates that 69 percent of marketers want to use cross-media communications. However, only about 20 percent of printers offer these services in any significant way. “Printers looking to separate themselves from the competition and build deep, loyal partnerships with customers will want to quickly understand and offer cross-media services,” she adds. Open communication is essential for PSPs/MSPs that step in to take control of cross-channel campaigns on behalf of their clients. “From the printing company’s perspective, one of the challenges that come with managing campaigns is that work is being done on behalf of another organization. “So there has to be clear and open communication, as well as trust, between the printing company and the marketer that company is serving. Simply gathering and presenting the data can often be cumbersome and time consuming,” says Tueckmantel. She adds that many printing organizations are interested in offering more campaign management services, but are concerned with cost. This goes beyond the price tag of technology and into an investment into the IT skill that an interactive advertising agency might staff. In his experience, Cholmondeley says few companies who identify themselves as PSPs offer campaign management services. This may be because offering such services require sales and implementation expertise that many PSPs don’t typically have. “Most often, campaign design and management is outsourced to MSPs by companies having small or no marketing departments. Companies with larger marketing departments may also enact this change if an MSP can demonstrate that they have better expertise in personalized, relevant, integrated, cross-media marketing initiatives. However, these marketing departments will often choose to outsource the execution of the campaign while designing and managing it themselves,” he adds. For PSPs and MSPs that do provide cross-channel marketing, the ability to provide tracking and reporting capabilities on marketing campaigns for clients is an important differentiation. “Campaign reporting is something printing companies often do not offer, in large part because the solutions available until now were not easily accessible to printers,” says Tueckmantel. “However, knowing the amazing marketing results printing companies often accomplish for their clients, there is no reason why they should not also own more of the marketing campaign process, including campaign reporting,” she adds. In the past, campaign reporting was handled by the marketer, “and one wouldn’t think that the PSP/MSP would be involved,” say Fitzgerald and McCrary. However, they point out that the print world has changed with the help of digital technologies and now, many PSPs have expanded their portfolios to include applications and platforms that enable them to be as actively engaged in helping customers create, manage, and track results of campaigns as they are in the printing of the materials for the campaign itself. “These offerings allow PSPs to bring value-add to their customers, helping to turn traditional direct mail projects into much broader multi-channel campaigns that reach a larger and yet more targeted audience, driving greater results,” note Fitzgerald and McCrary. They add that for service providers, it means a larger business reach and greater revenue potential, and for their customers it means increased sales, memberships, and product pick up. She says the good news is that the program manager/administrator can place controls to ensure the appropriate people have access to the appropriate reports. Solutions such as EFI’s DirectSmile Cross Media, PTI’s MarcomCentral, and XMPie’s Circle software provide integrated cross-channel marketing tools that incorporate tracking and reporting functions. Tueckmantel says EFI’s newest campaign management tool is EFI DirectSmile Cross Media version 7, which is designed to empower users to create highly effective cross-media or multi-channel marketing campaigns without having to acquire HTML programming skills. The software puts assets, designs, databases, and previews all on one screen for users to manage for increased ease of use. It also features an automated framework that simplifies the creation, deployment management, and reporting of sophisticated cross-media campaigns, including mass emails/SMS messages, as well as individually triggered messages. The solution’s new Marketing Portal functionality provides an online portal where marketers can log in, track, and order campaigns. The marketer can see the status of any individual campaign. “There is a level of tracking and transparency that builds more trust in the print provider/marketer relationship, and I think that creates a much bigger opportunity for printing companies to really be their clients’ key asset in multi-channel marketing campaigns,” says Tueckmantel. Integration is another key feature. DirectSmile Cross Media is developed to integrate with EFI management information systems and enterprise resource planning products used by many PSPs. Beyond that, it offers an optional integration that provides users with the ability to connect with third-party customer relationship management (CRM) systems. PTI’s MarcomCentral is a software as a service offering that provides Web to print and marketing on demand capabilities for both PSPs and enterprise corporations. It centralizes and automates the creation, printing, management, and delivery of both static materials as well as personalized, variable data pieces through FusionPro VDP technology, which is built into the solution. End user customers can request items using predefined, press-ready PDF templates, and can easily follow the job through the production and fulfillment process from anywhere using a Web browser. PSPs expand offerings and attract new customers who order through online storefronts. Enterprises implement marketing portals that enable integration of marketing resources, brand control, streamlined marketing operations, and increased campaign effectiveness. “In today’s world, differentiating yourself in the production printing space is difficult. The market is more competitive than ever, with speeds, capabilities, and quality all aligned across manufacturers and pricing pressure is enormous,” admit Fitzgerald and McCrary. Ricoh acquired PTI in late 2014, and together the two organizations have worked to create new opportunity for print providers. For example, Ricoh provides its 1to1 Create Marketing Services, which leverages PTI’s platform to create new targeted multi-channel campaigns that allow for expanded market opportunities and company growth. The cloud-based subscription service offers solutions to select prepared graphics, target customers and audiences, acquire mailing lists, and set prices. XMPie provides its Circle software, which is designed to help customers manage one-to-one multi-channel marketing campaigns during all stages of development. With Circle, service providers, agencies, and clients can sketch, view, plan, build, automate, and analyze one-to-one multi-channel communications campaigns at every stage of development. “Using highly visual campaign flow diagramming tools and the intuitive user interface of Circle, all the potential stakeholders of a marketing campaign can preview the various touch points and monitor the results as it progresses,” explains Berlin. “With an easy-to-use drag-and-drop application for diagramming multi-touch workflows, Circle has an unlimited canvas on the cloud where the campaign’s story can be created, added to, commented on, and approved for execution,” she adds. Circle enables touch point automation so that campaign activities can be scheduled in advance, with reoccurring patterns or triggered to populations selected by CRM data or based on an individual’s behavior. Circle is a marketing automation tool designed for the graphic arts to create, execute, and automate personalized communications campaigns across multiple media in print, email, and the Web. The latest campaign management tools provide capabilities that allow PSPs and MSPs to get into the marketing game while collaborating with clients.